I dream of having an outdoor shower in my garden. Who doesn’t? Originally I thought one would only be suited to a beachside home. You know the type – a tropical oasis, large leaf plants, splashes of bright colour and the sound of waves floating on the sea breeze. That tends to be the images one conjures up when thinking about an outdoor shower. But why limit outdoor showers to rinsing off the salt and sand after a trip to the beach. We can have them anywhere! Rustic Outdoor Shower, this one comes with a bathtub. Yay! This renewed desire for an outdoor shower came about after I visited a client’s garden. Together we are turning their unused garden into a beachside haven. I was doing my first site visit and taking a tour around the garden and there it was, an outdoor shower, looking a little forgotten about. At the moment it is nothing fancy, in fact you could walk past it and not know it is there. But you wait, it will be a wonderful destination in the garden once the creative juices start flowing and the possibilities unleashed. I love the colour of the wall and the large stone paver surrounded by pebbles. This got me thinking about what makes a great outdoor shower. It’s one thing to have water pouring out of a shower head, it’s another thing to make it a destination in your garden that you, your family and your visitors can enjoy. I love this shower with its curved wall and hanging bucket, it creates interest. Mediterranean holiday anyone? Here are three things I would consider when planning an outdoor shower. –While you may still have trouble picturing an outdoor shower anywhere but in a tropical paradise don’t go turning a teeny tiny spot in your cottage garden into a large leaf beachside oasis. It won’t work. It will stand out for all the wrong reasons. Allow the shower space to compliment what you already have. Consider what is already in your garden and enhance it. Consider the plants, materials and the colours. A outdoor shower with a view. –There are endless amounts of shower heads and taps available to incorporate into your outdoor shower. From contemporary to traditional there is one to suit the look and feel that you are after. Take a little time to browse and find something you will be truely happy soaking under. 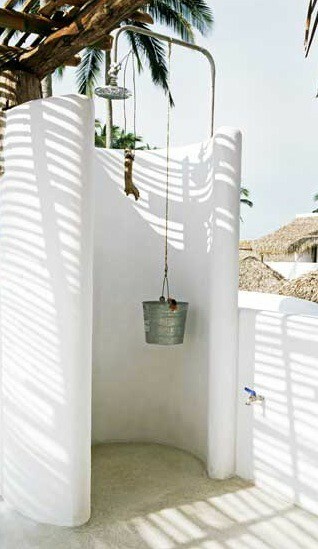 — The finishing touch to your outdoor shower should be the towel hooks. You can’t have a shower without somewhere to put your towel, whether you have come from the beach or the paddock. Add one as a feature or have them for practical purposes only which ever you decide on don’t forget to consider the look and feel of the space. The addition of hooks will add to the destination and provide somewhere for the user to put their towel other than on the ground. These towel hooks are a feature of this outdoor shower. I hope I have inspired you with some of these images. If you would like to see more outdoor showers you can visit my Pinterest board ‘Outdoor Showers’ here where you will find lots more wonderful images. There are still more things to consider when designing and installing an outdoor shower such as water use and availability, drainage and aspect, to name just a few. Always consult a professional before undertaking design and construction of a new outdoor space, there may be more things you need to know than you are aware of.